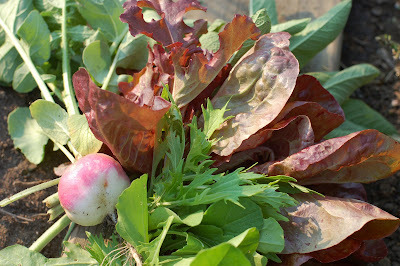 Friday's harvest from my garden: A radish, red lettuces, mizuna, arugula, and sage -- all grown without the use of chemicals. This post is dedicated to Rachel Carson, author of Silent Spring, on the centennial of her birth. In Silent Spring, this courageous woman criticized the use of synthetic pesticides and examined in detail their detrimental effects on plants, animals, and the human body. The book set in motion a wave of events that ultimately led to the banning of DDT. That all looks great. And kudos for the lack of chemicals. We don't use any either, but I always forget to mention that. I forget that using nasty chemicals is many times thought of as "the norm". I say organic is always better! Christa, it's a wonderful tribute. Thanks for all those links, too -- great stuff! Happy Green Thumb Sunday! Looks like a delicious harvest. Thanks for the info on the book Silent Spring, I'll be looking for that to read. Organic is the best way to go! A bountiful harvest. A great tribute. Hey that's a great collection of links, too. On my blog you asked my secret with chervil. I originally broadcast seed in a section of garden that is partially shady in the afternoon, and slow to get sun in the morning. It likes cold weather but also likes mulch to overwinter. The seedlings will form in late summer to mid-fall. If you leave them alone, they will form colonies that flower in late spring. The secret of getting the first seeding to flourish is to broadcast seed over a wider than usual area. The seeds will find their own best conditions with this method. If you time your seed sowings well and have a cold frame where some chervil takes hold, you can keep your eggs nicely seasoned with the leaves for several months of the year. This book is on my reading list. This is a lovely tribute post. This flowers are lovely and that was an excellent book. Happy Rachel Carson Day to you, too! Great theme for a post. Let us all learn from her. I always wanted to try arugula. The harvest looks good. I too garden organically. Your collection of veggies is mouth-watering and it is near bedtime!! Thank you for reminding us about the work of Rachel Carson and for posting the links ... she was an incredibly brave spirit. What a delicious feast and three cheers to Rachel also! Off to read more about your tribute person. The photo looks great. Thanks for visiting my blog. Acey, thank you for the tips on growing chervil. Last time we had our plant in a very sunny spot and it dried up. Your method of broadcasting the seeds makes sense. I will try again. Thanks. Enjoy your beautiful chemical free veggies. Go Rachel.